Experience the advantage of using environmentally-friendly disposable dinnerware like Green Wave bagasse products. 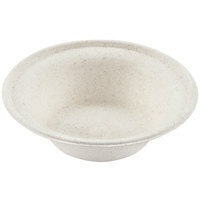 Made with compostable sugarcane, these plates and bowls are perfect for both hot and cold foods served at restaurants, catered events, and sandwich shops. Green Wave dinnerware is completely non-toxic and biodegradable, helping to cut down on landfill waste. Since this disposable dinnerware decomposes, it’s also a great alternative to plastics and foam materials. Green Wave bagasse products are designed to be safe for the environment. The sugar cane plates are both compostable and biodegradable, decreasing the impact your business has on the environment. Their durability also makes them a great choice to use at your outdoor catered events. For more eco-friendly products check out our biodegradable plastic bags, green paper cups, and biodegradable food trays. If you're wondering where to buy green wave biodegradable plates and compostable plates, platters, and trays, we have a large selection of green wave biodegradable plates and compostable plates, platters, and trays for sale at the lowest prices.